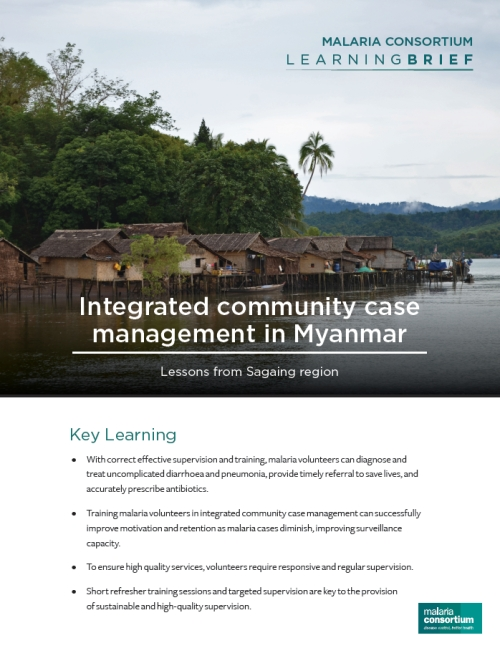 From June 2016 to June 2017, Malaria Consortium implemented a pilot project that sought to integrate and scale up Myanmar's two community case management components, to ensure the health system's capacity to respond to all major childhood illnesses. Malaria volunteers were trained to manage cases of pneumonia and diarrhoea, as well as malaria, and assess and refer cases of malnutrition. By expanding the roles and responsibilities of MVs in this way, Malaria Consortium also sought to improve volunteer motivation and promote the retention of MVs in areas where malaria transmission rates are declining. This brief provides key lessons learnt around using non-qualified community members to treat childhood diseases and recommendations for future implementation and scale up.